In a couple weeks we will be at Chandail in Houston. The class is very exciting! 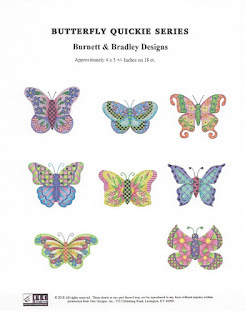 It is a Robbyn's Nest design of Butterflies. So, what makes this class extra exciting? The bling! and Bling is an understatement. There are actually 2 classes if you prefer. 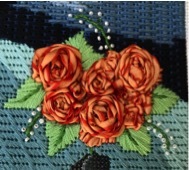 The class begins with a one-day class all about adding beads to needlework. 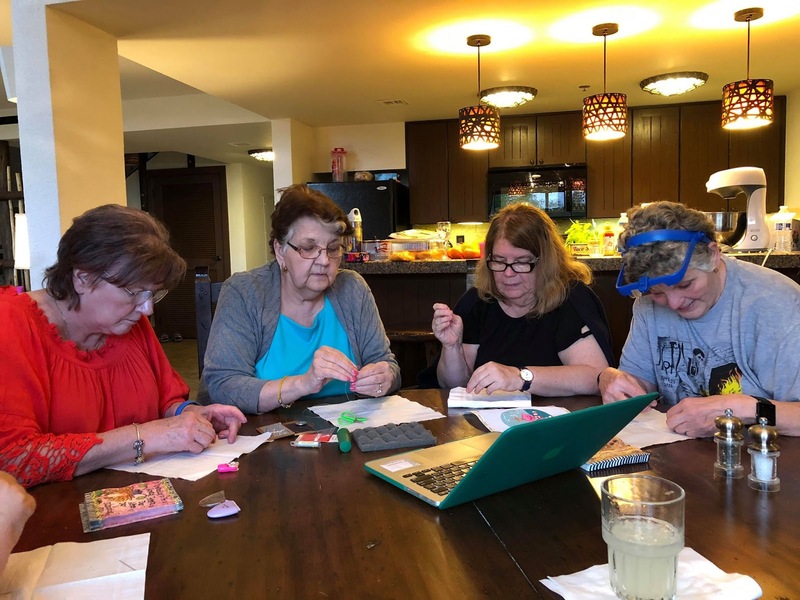 Then we gravitate into the next two days where we apply some of the techniques we learned in the beading class. Wait until you see the finished piece! I won't share until after the class as they should get to see it first - so stay tuned. I believe that Chandail does handle ghosts so you should contact Saira at series.chandail@gmail.com and ask for details. Of course, we'd love to have you in person so you can join in the giggles! 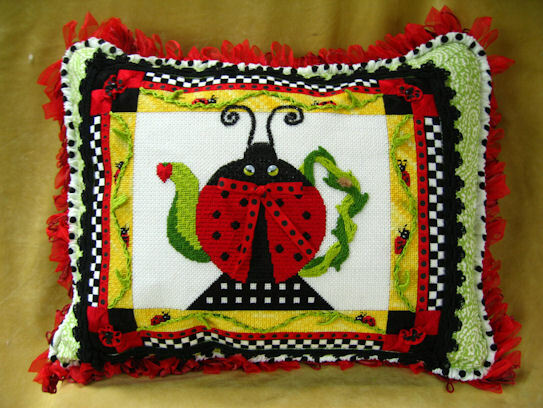 The first part of August we will be at Stitchers Garden in Naperville, IL. This is an embellishment class and she is offering several options broken down into 2 day increments. I do believe the class is full however. 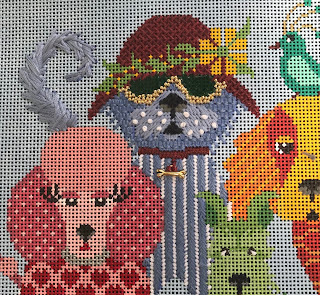 The American Needlepoint Guild national Seminar is set in Washington, DC this year. 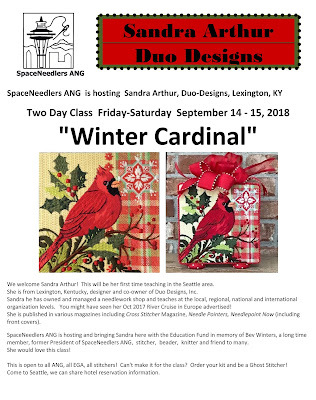 It is held from August 22-27, 2019 I am fortunate enough to be teaching two classes at this event. 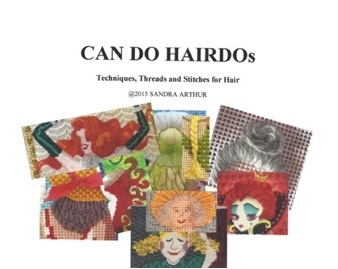 One class is August 25 and is on hairdos. It is called Can Do Hairdos. This is an encore class. It involves several techniques that can be used to create different types of hair styles - curly, straight, wavy, etc. 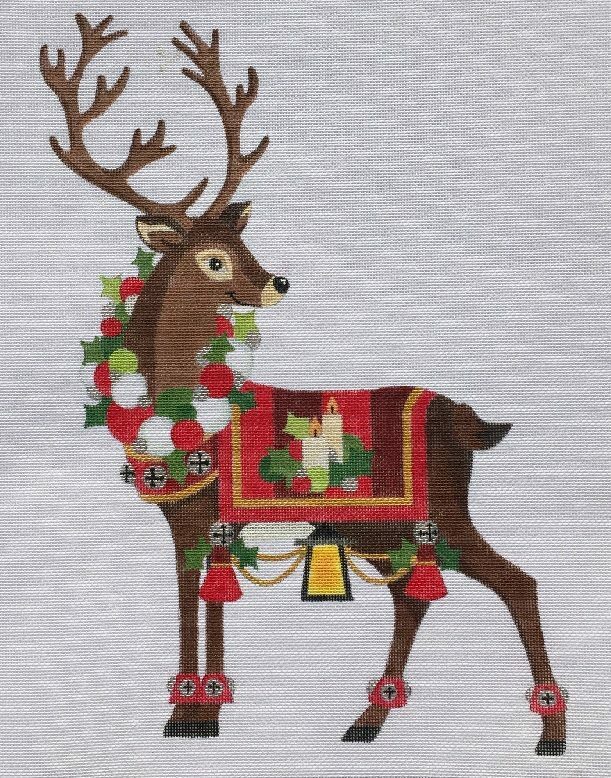 All materials are included except stitchers bring their own normal stitching supplies and stretcher bars to fit the canvas. 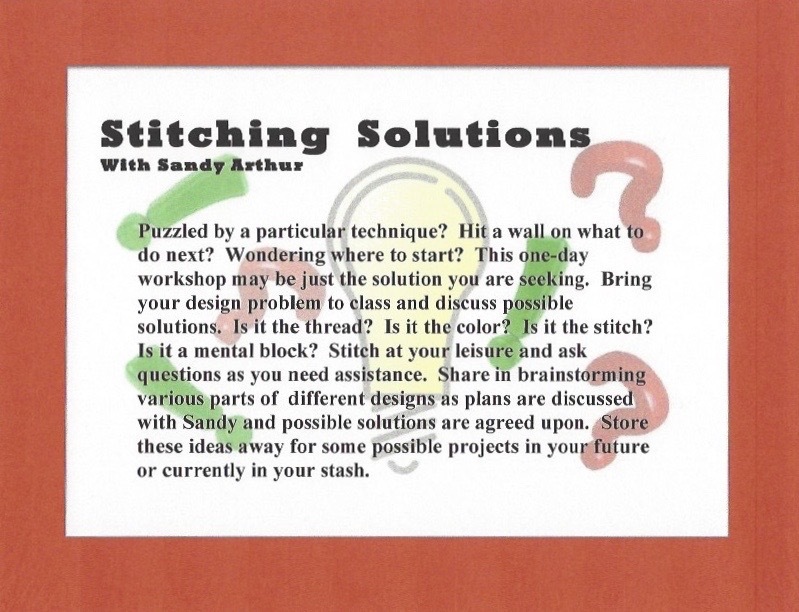 The second class is called Stitching Solutions. 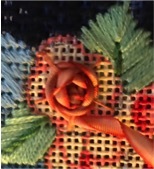 This is a one-day workshop for assisting participants with problems they may have with a particular technique on a canvas they have. 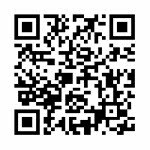 We will have fun analyzing those projects that are brought to the class and share discussions regarding various possible solutions. Then we are off to the West Coast to teach for the Space Needlers ANG Group. 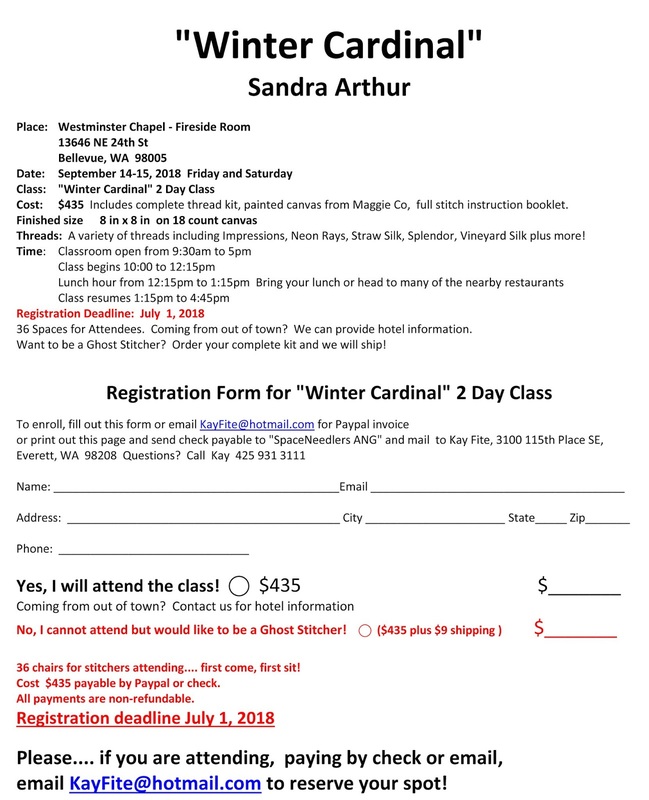 We will be teaching the fantastic Maggie piece Winter Cardinal on September 14-15, 2018. 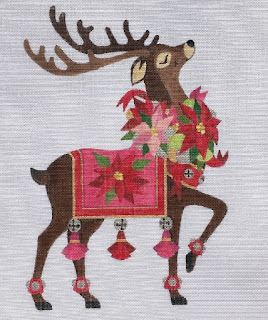 Stitchers should contact me at KayFite@hotmail.com to register. As it says on registration form, checks made payable to SpaceNeedlers ANG and my address is listed for mailing. I can do paypal also. 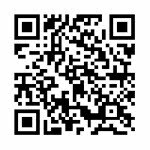 Also want to send out a teaser. 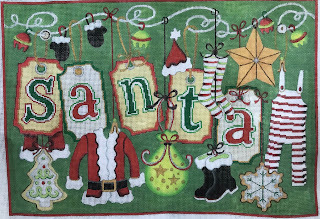 Email me at duodesignsinc@yahoo.com if you would be interested in participating in an Online Mystery Class for the too cute Strictly Christmas 'Tag's' designs. 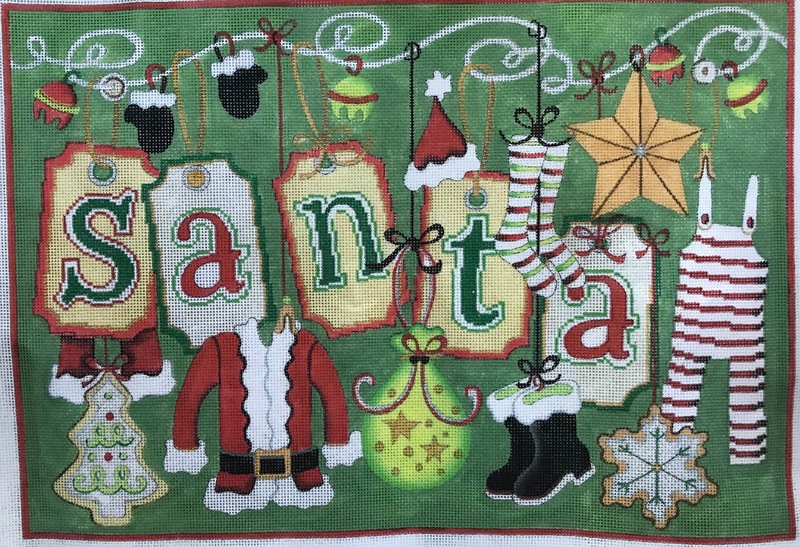 I am considering the one of Santa's Tags and/or the one on Spooky Tags. It will depend on whether there is enough interest. These are on 13ct canvas and will involve a 6-month class composed of one class a month. The classes will not be starting until mid-to-late 2019. Just let me know and we'll see how that works out. They are super fun! Have a wonderful and safe Memorial Day Weekend. Thank you to all the veterans out there for your service - including my Dad, Husband, Brother, Cousins, Relatives and Friends. Around the middle of each month is always exciting! This is the time range we try to post the current lesson for the month. This month has been so much fun - so what is new? Right? I always have fun. 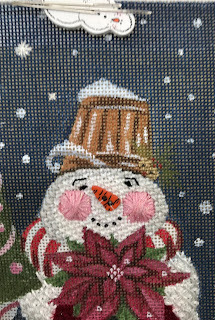 Snow Happy Trio has its fourth lesson this month. Really? This is going so quickly. This month we completed the last snow person of the trio. The next 2 months will be devoted to the remaining accessories - wreath, tree, hats, flowers, scarves, etc. Christmas Stars is on Day 5 - Five Golden Rings! Moon Gazer is in its third session. 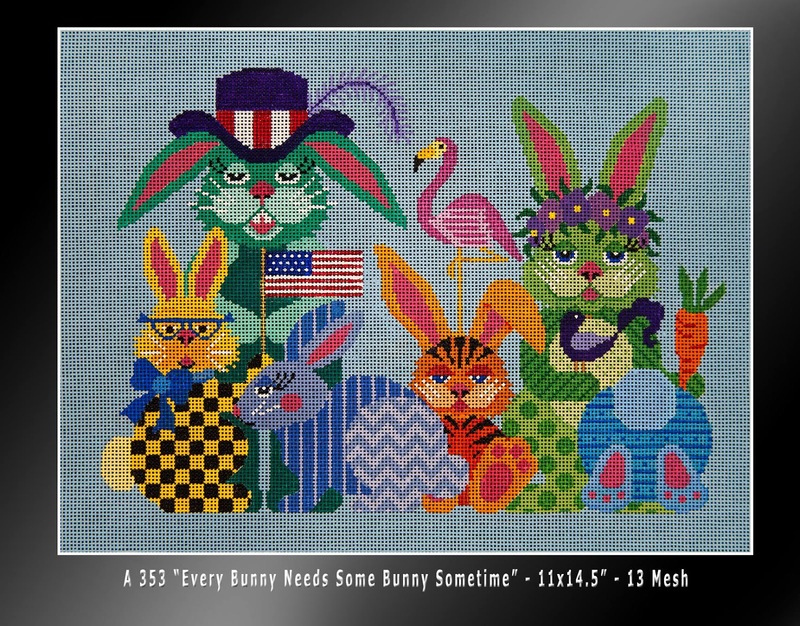 This month we did the rabbit. Now we are ready for the remaining fern, bushes, etc. Catitudes has it's third session also. 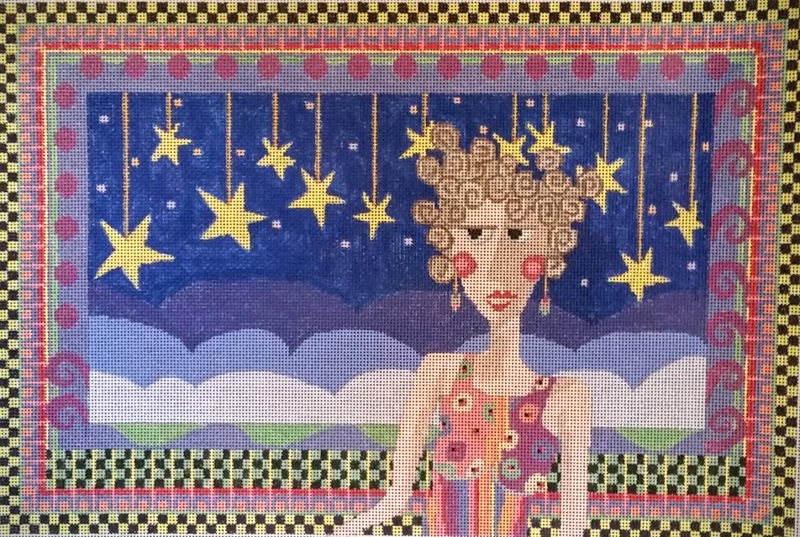 This month we introduced a darning pattern background I designed for this canvas. These scurrying stylized mice will be in my book on darning patterns that is in the draft stages. 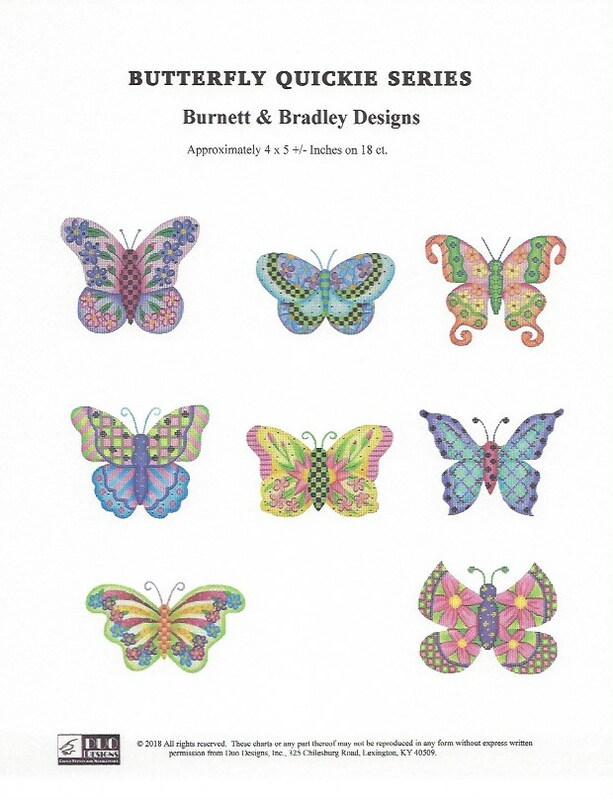 Additionally, this month we have two new designs joining the crowd. 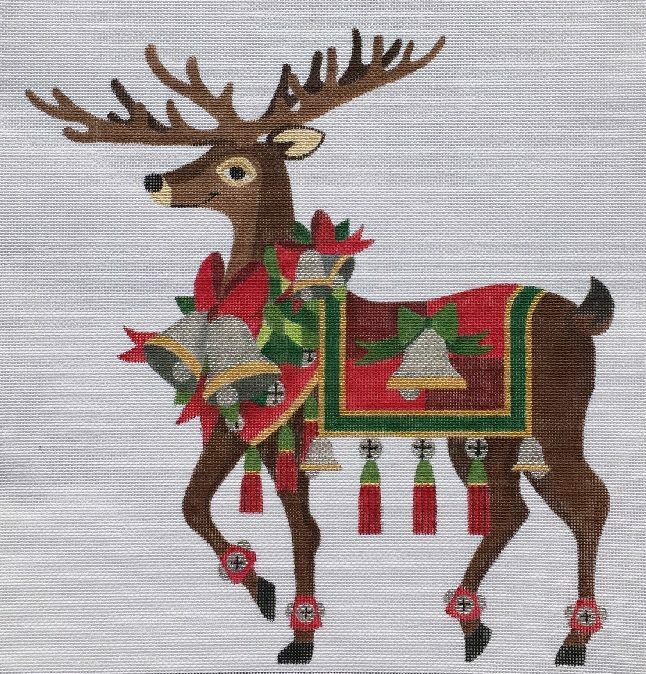 Reindeer with Bells Blanket by Raymond Crawford. This guy will be sharing the same background sky and ground snow as the others for the first lesson as I am approaching them as a series and the main elements will be the same. The accessories and stitch directions will be the kicker. And last but not least the ever fun Dog Gone Good from JP Needlepoint makes its introduction. Mr. Cool Dude was up first. Besides everything else about him I just fell in love with his tail! Whoever is next? Goodies are continually coming in for our upcoming Riverboat Stitching Cruise - Stitching Down the Danube. It is very exciting as it becomes more and more real each day. 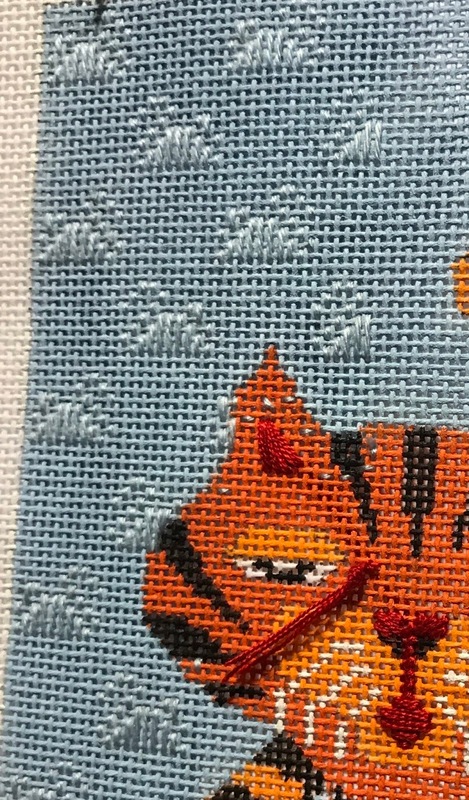 I'm stitching away on the optional cruise piece as well. At my recent runaway my peers seemed to like how it was progressing. Several commented that the picture just did not do it justice. How many times do we say that? 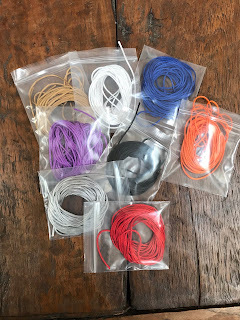 Hope to have something to share soon so those of you who are interested may order your kit and have it in your creative little hands! Look at this wonderful staircase on our SS Beatrice! I am hopeful that we can quit playing long enough to have a group picture to commemorate this event! If you would like to come along just email me for details at duodesignsinc@yahoo.com. 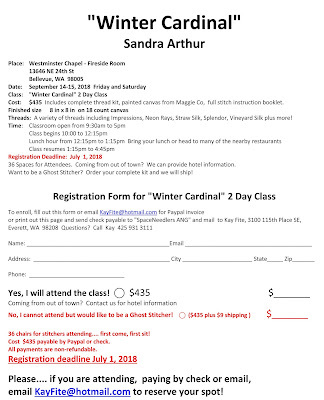 We would so love to have you join us! The more the merrier. Wreath from Raymond Crawford -oooo the green one! Have a great weekend everyone! 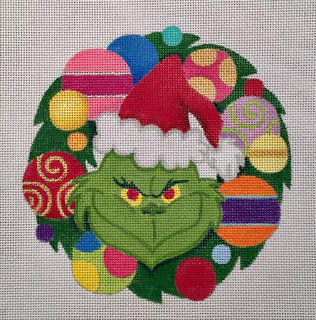 I think I'll go watch the taped wedding festivities as I stitch on more lessons! WORKING, WORKING, WORKING! GOTTA GET THE NEXT LESSONS READY! Well my little retreat has come and gone quite quickly I must say. It was a much needed break and a wonderful way to have a little time with my daughter as well. In a few days we will be posting the next set of lessons for our Online Mystery Classes! I just can't seem to describe how much fun I have stitching these guys and the enjoyment I get from sharing them with you. This past month I played withs sharing some WIP videos and they seemed to be accepted well. Stay tuned next week for a sneak peek at what the various lessons have turned out to be! We are creeping up on our new riverboat stitching cruise for this year! It is hard to believe that time is almost here. 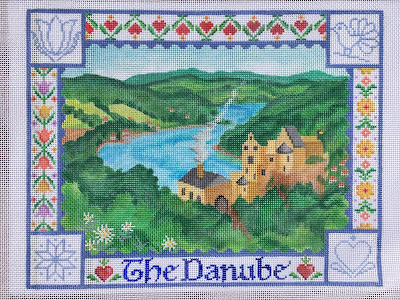 Stitching Down the Danube is slated for October 21-31, 2018. 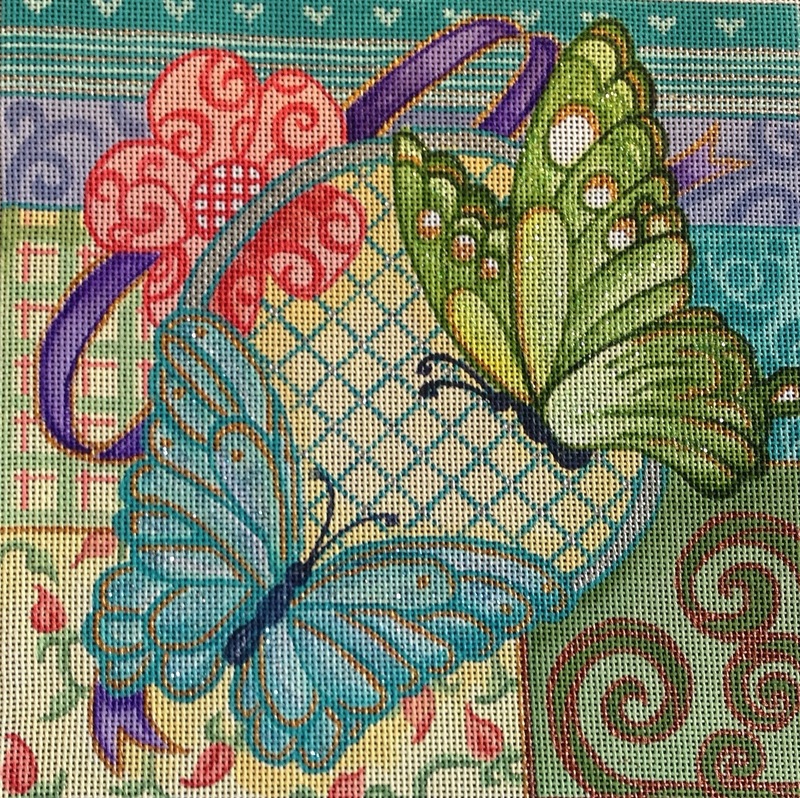 We will be flying into Prague; have night of classes while at the hotel; move on to Germany, Austria and Hungary - stitching along the way! 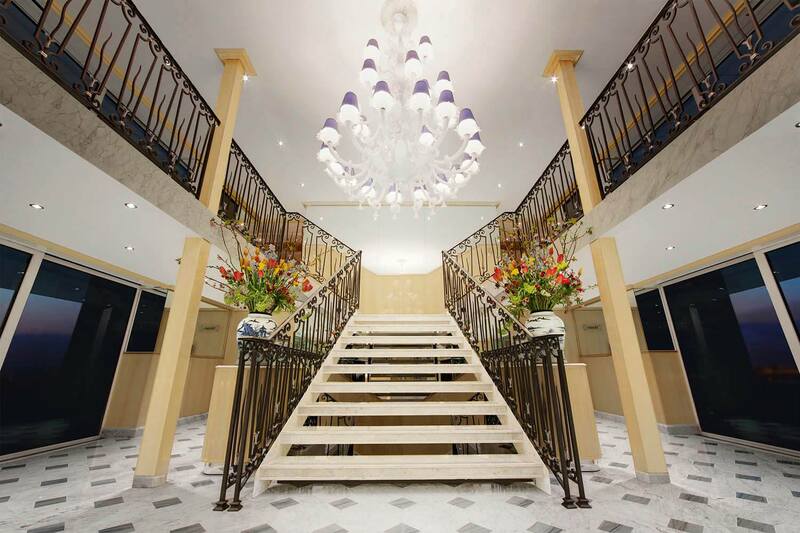 Here is a brief look at the wonderful SS Beatrice that will be hosting us! Blue happens to be one of my favorite colors! Isn't she beautiful! And stitching room abounds! Can't wait to get to play on her with all my stitching buddies. All our included excursions were on very comfortable buses when the event dictated using one. All the guides are so caring and definitely looked out for us. 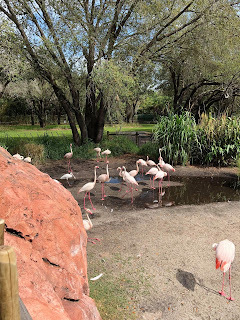 Those of us who are 'gentle walkers' (isn't that a cute name to give us) really appreciated their care and concern for our well being as they saw to it that we did not miss anything along the way while traveling at a more - shall I say - relaxed pace! We have the optional class exclusive canvas design painted for us by Kate Dickerson. This is painted from a picture of actual castle ruins in Austria! It is so exciting. 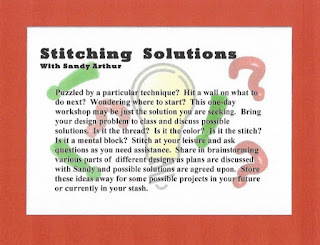 I am stitching away to get the materials gathered so that I may offer it to you as an optional class! It is painted on 18ct mono canvas. 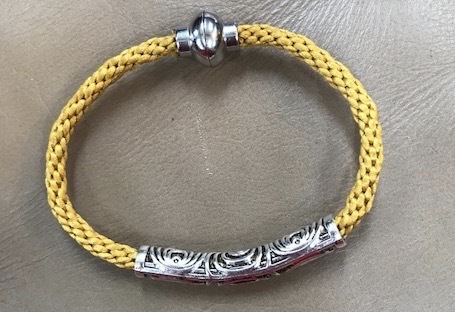 An optional mini-workshop is the kumihimo class where we will be making a beautiful bracelet. There are so many wonderful colors - the class kit will be the luck of the draw colorwise but there are also optional thread kits available to choose from for purchase. This class and kit is going to be so much fun and when we are finished we will have a new piece of jewelry and a finished project to show for our efforts! In addition here are some of the colorful options for extra bracelets. And, in addition to these classes, there is going to be a beautiful, useful surprise class! No charge. So fun. And there will be other mini-workshops as well. But, don't despair! You do not need to take a class. 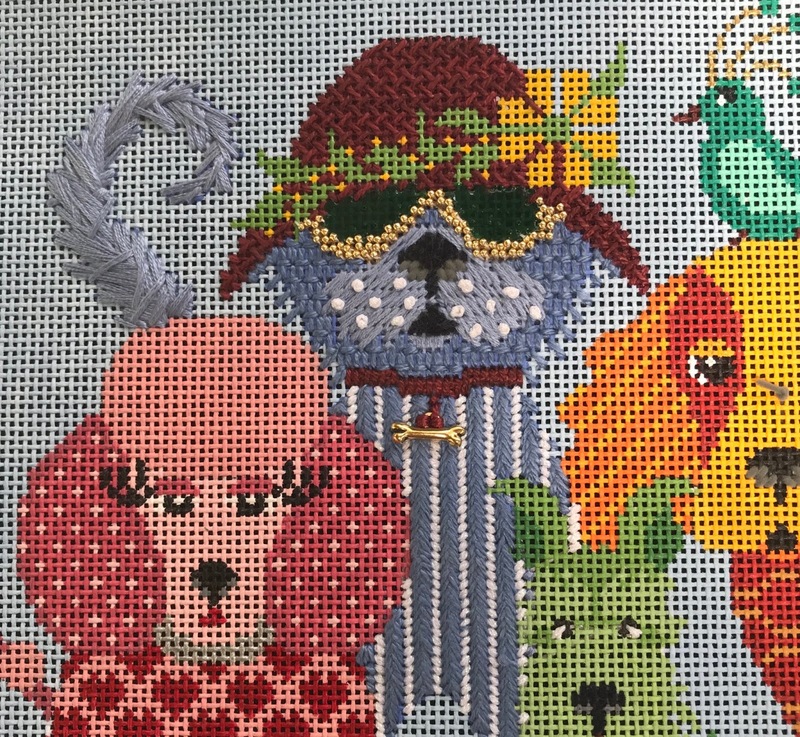 You are free to bring a canvas of your choice and if you are in the paid stitcher group you can join us in our stitching adventures! We'll have more to share as time draws closer. We would love to have you join us. I understand that the staterooms are about filled so don't linger if you are interested. Contact our travel agent - Liz at Viking Travel - lwolak@vikingtvl.com or email me with questions as well at duodesignsinc@yahoo.com. This has really been a wild time for me these last few months. 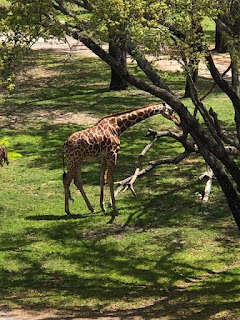 I am hoping to be able to focus a little more now that I have returned from FL. 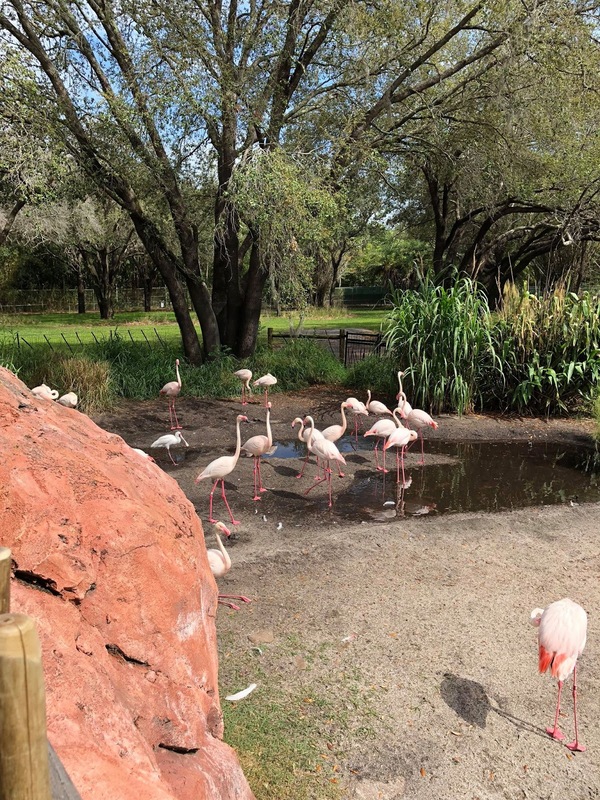 Don’t get me wrong – I love, love, love traveling to new places and meeting new students, but every now and again I need to revisit my hubby of 56+ years – right? I thought this would be a great opportunity between class postings to share a little information with you. Anyone who ever takes any of my classes – whether they are f2f, correspondence, cyber, etc. 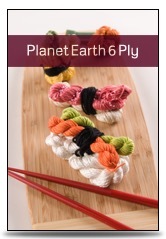 – have probably figured out that some of my favorite go-to threads are from Planet Earth Fibers. I frequently call upon Planet Earth Silk when I need really good coverage. The colors are luscious. 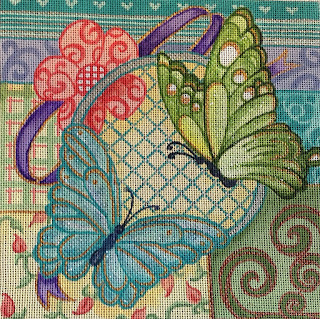 While I occasionally use this thread on 18ct fabric, it is best on 13/14 ct . (which seems to be becoming more and more popular for those of us who are looking back at our 50thbirthday). I think there are something like 225 colors in this line. It is no secret that I am the biggest cheerleader of Pepper Pot Silk. Oh my goodness what a treat to work with. I use it constantly. If anyone listens I sing its praises. The only problem for me with this thread is that the colors are food names – hmmmm. If I said Planet Earth Silk was luscious, they pale in comparison to my fav – Pepper Pot Silk (Pepper Pot Silk has a unique color line. completely different than Planet Earth Silk, 6 ply silk or the Merino. 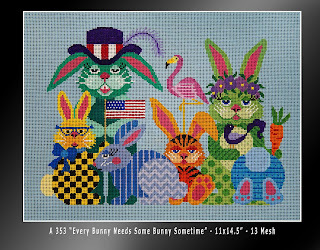 Of course, the basics red, white, black and blues may cross over)! This line of threads has approximately 226 colors. And, I might add, they continually add new temptations. Probably one my most asked questions about Pepper Pot Silk is how do you separate it. You DON’T! It is manufactured to use just as it comes from the skein. Now, there are times we might work to pull out a bit for a special stitched area for dimensional effect but we do so with the caution that we are weakening the thread and if we do this we must live with our own created consequences. So, really, just don’t do it. Use one of their other compatible plied threads. 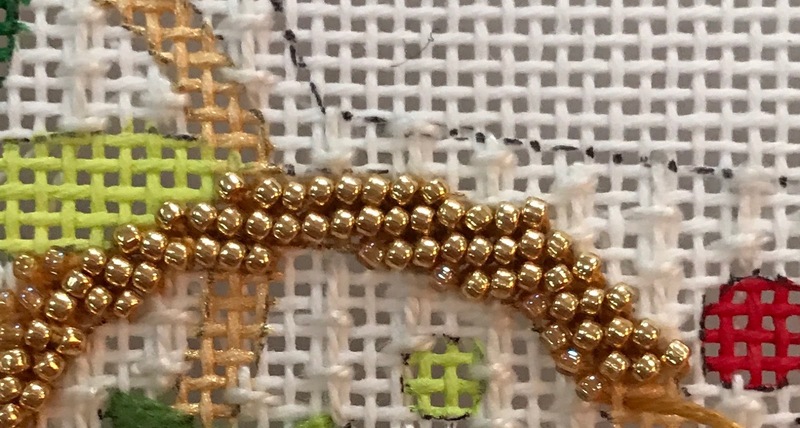 PE6 is a fantastic thread for controlling the volume of the stitch. This 6-ply silk also comes in the scrumptious colors across the spectrum (about 85). 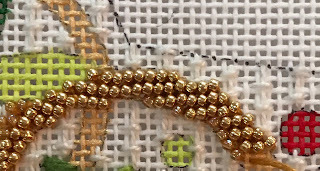 This thread is to be laid while stitching. When used properly the sheen and finish on your stitching is to die for. 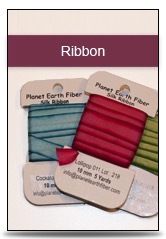 One of the best kept secrets in my opinion is the tonal ribbon manufactured by Planet Earth Fibers. 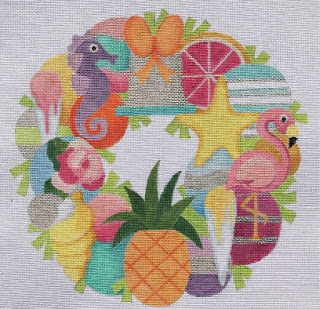 These silk ribbons provide an easy way to incorporate shading to ribbon embroidery and do it beautifully. 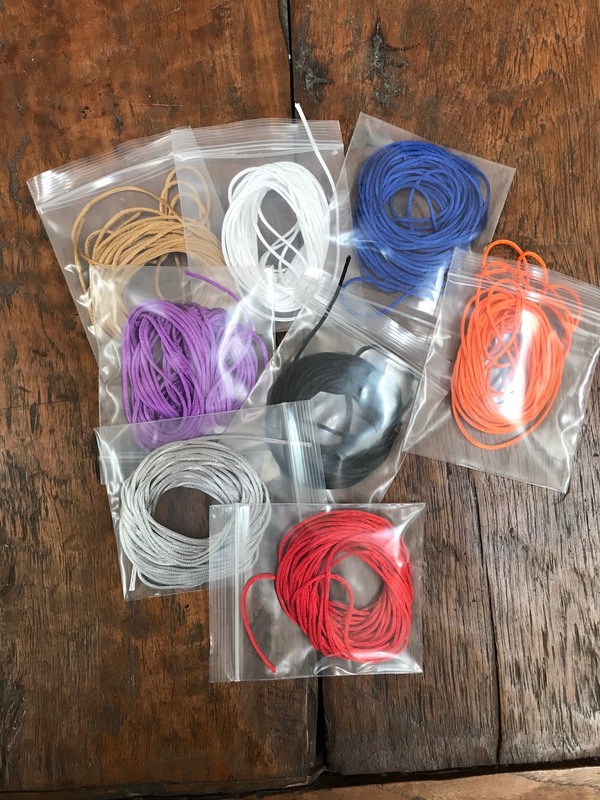 There are 40 colors available in 4mm, 7mm and 10mm. Here is a sample of a bouquet we recently used on one of our Online Mystery Classes – Steampunk Cat. Aren’t these roses scrumptious? 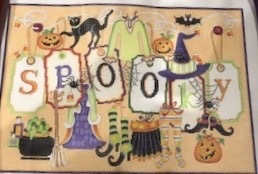 Even though I stitched these I am in awe of the wonderful affect the silk ribbon helped produce for the end product. There are many other threads in this line as well such as Planet Earth Opal, Variegated threads in the PE6 line and Pepper Pot, the so soft and luxurious Merino Silk, and on and on. Oh, and I certainly cannot overlook Furr-Fuzz-Funn - what a hoot - so cool! Animals will never be the same - and they are just the beginning of uses for this thread. For shops, their customer service is top of the line. Their turn around time is fabulous! It is a great company with which to do business. 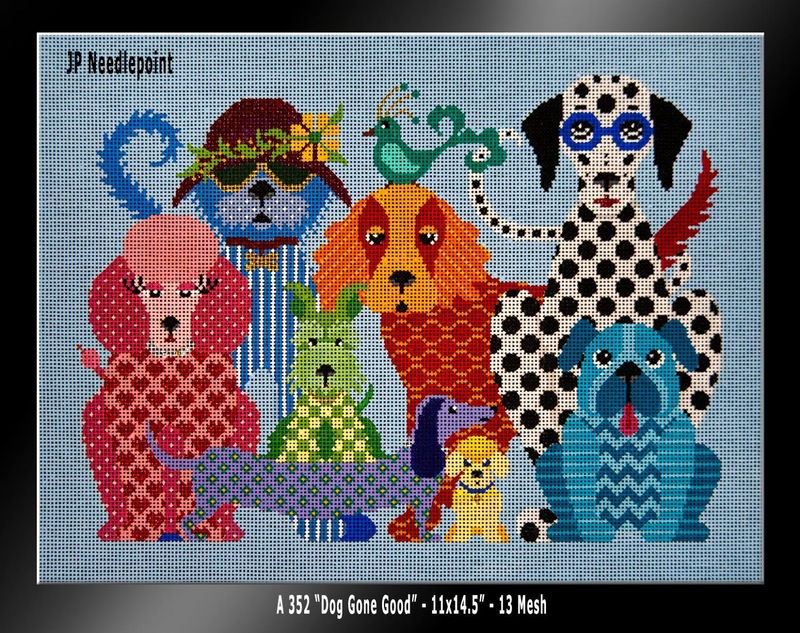 For my stitchers, please visit your local needlepoint shop and check out these threads. I truly believe you will fall in love with them as I have. Anyway, for many of my followers, these are yet undiscovered threads. Please try them out when you come across them – you will not be sorry! This is how I am feeling right now. 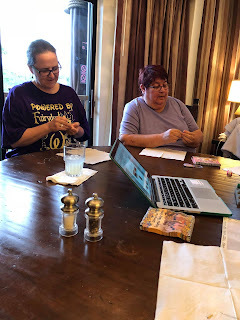 We are at a stitch-away retreat in FL. 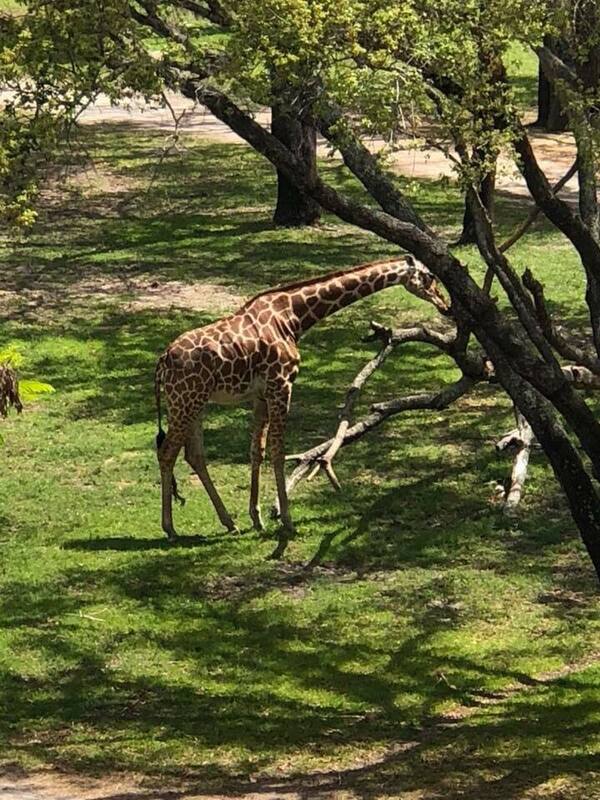 More specifically Animal Kingdom in Disney! One night we went to the community room for a break and did a ceramic mug of Mickey's pants. Can't wait to see if our mugs look like this! Another adventure included a mini-beading class. Looks like heavy concentrating doesn't it? Well, I have not ventured out to shop yet, but several have managed to leave a 'little' money here and increase the local revenue. So tomorrow may be pool day for some. I will try to get more stitching done trying to get ready for the next set of lessons. 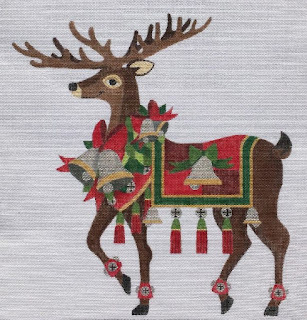 Reindeer with Bell Blanket. . . If you are interested in more information for these Online Mystery Classes just sent an email to duodesignsinc@yhahoo.com. Okay, back to my relaxation phase . . . .